This car was driven to a 5th place overall finish by Johnny O’Connell, Hiroki Katoh, and Pierre-Henri Raphanel. That would be as high as a Panoz finished at Le Mans, being matched again by a private team in 2003. Still, an impressive feat for the small company located in Braselton, Georgia. This car has a significant design aspect that differentiates it from other Le Mans Prototypes. Can you tell what it is from looking at it? If you figured out that this car is front-engine, you’re correct! 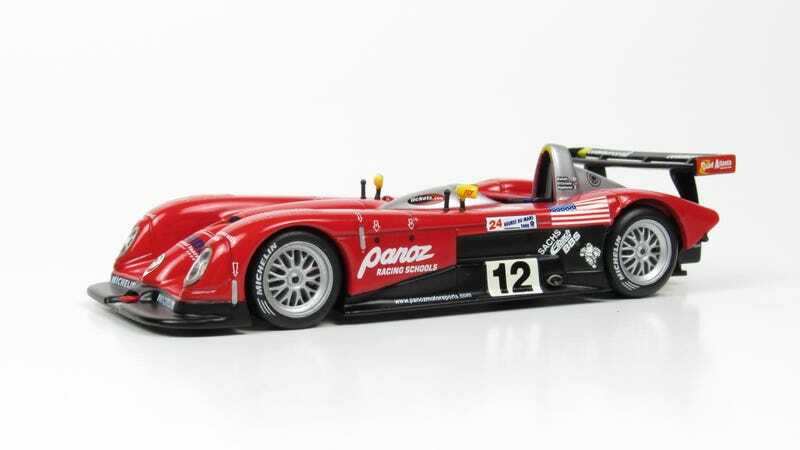 To my knowledge, Panoz has been the only constructor to build a front-engine LMP. They had a successor to this car that was also front-engine, the LMP07, but it was short lived and eventually replaced by an upgraded version of this car. This Onyx replica is pretty decent. The simple livery is faithfully recreated and there is good detail throughout, particularly in the interior. I have a handful of other Onyx models and they always come cheap, but mine have all been secondhand so I’m not sure how their retail price compares to the other brands.